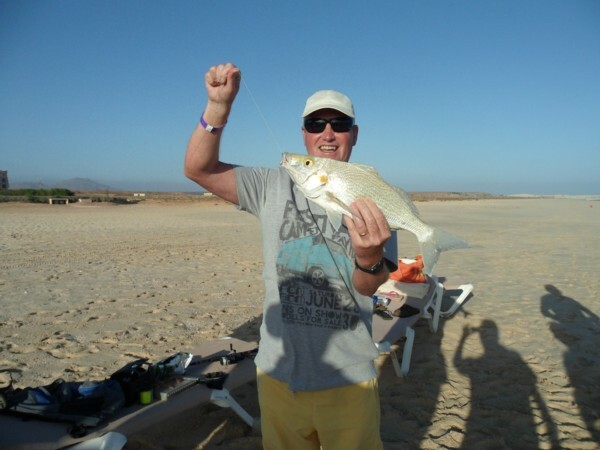 Cape Verde and so much fun with fishing. Towards the end January the rivers were still flooded and the decision needed to be made regarding a holiday. Now I’m due to be bream fishing on the 1st April on a new lake near Oxford and the rivers just didn’t seem to be coming good. So I decided two weeks 12th to the 26th March would be about right to get some sun on the back. 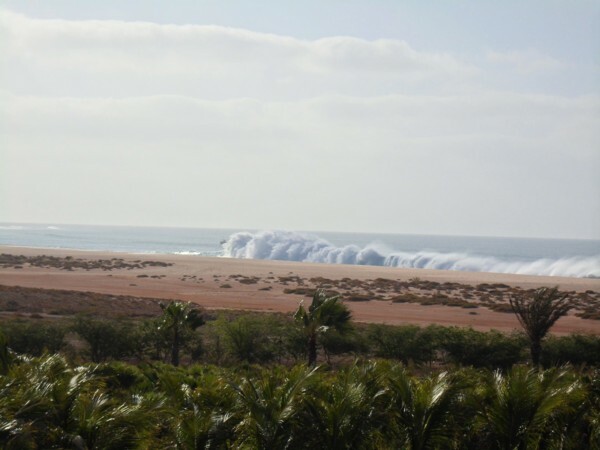 So we looked through and found the Cape Verde seemed to be about the best bet. 25c during the day and 20c at night. We had visited Sal island before so chose Bauna Vista as our destination. So soon enough the date came to leave and this coincided with some warm weather in the UK and the rivers lowered just in time for season end. Typical!!!!! Never mind the decision was made and off we went. The hotel was situated on the southern shores of the island. One hotel and 18 miles of beach to go for. 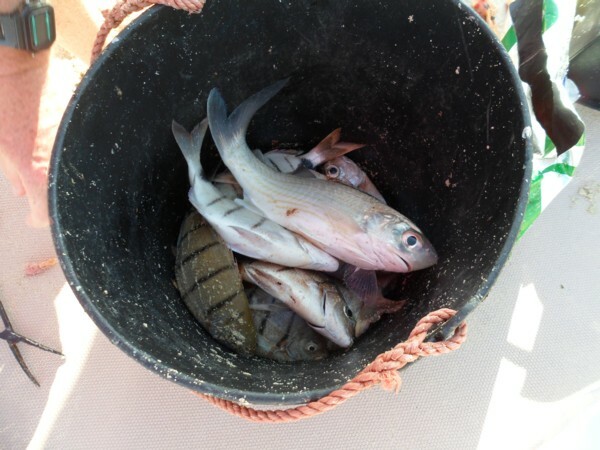 I had taken my telescopic rod and a small shimano reel with 10lb line. From previous experience on Sal the line needs to be of low diameter to combat the very strong winds that can put a dreadful bow in the line. A selection of lures and leads that were about 50g were put into the travel box together with a selection of hooks and other bits and pieces. 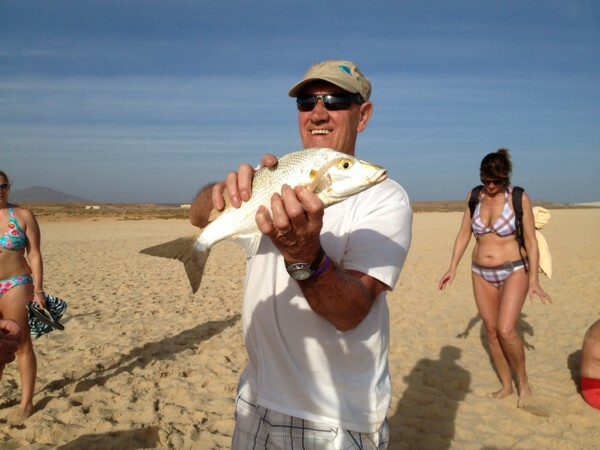 The first evening session proved to be a blank with the lures. So a few euro’s changed hands with the waiter in the restaurant and some raw prawns came my way. Well about 1.5lbs of bait. These went into the fridge back into the room, with a few complaints from “her in doors”. After a few days they didn’t half smell. But she was good as gold about it. 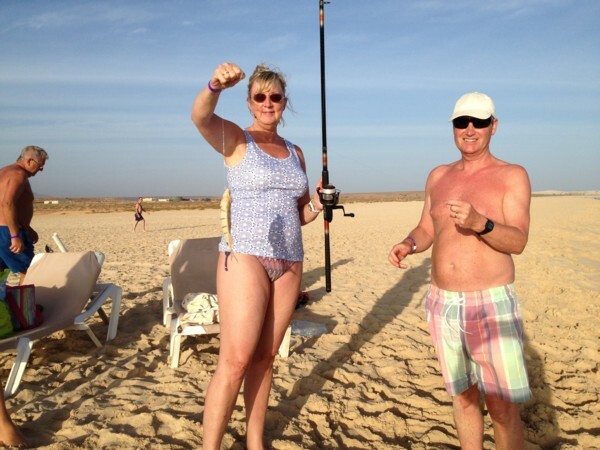 So the next morning saw me on the beach at 9am and casting out. I caught straight away. I asked the people who had laid out their goods for sale on the beach if they wanted any. One young lady said yes and gave me a poly bag. This I filled with about 6 bream like fish and she seemed pretty pleased when I stopped at 10.30am and handed her the bag. During the evening session that normally ran from 4.30 to 6.00pm I caught a few more. 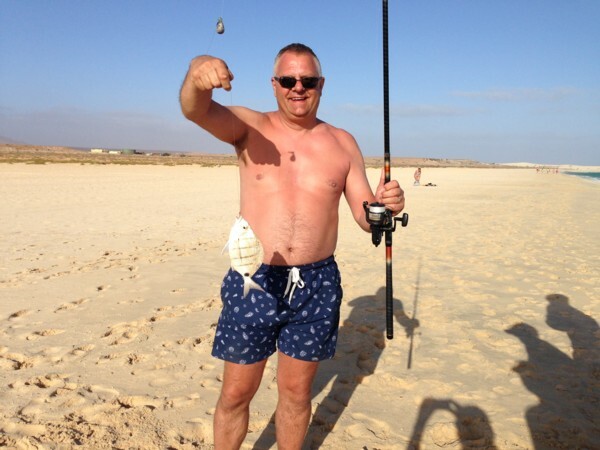 This time I was about to slip back a fish when a shout came from the dive centre to give the fish to them. So this set the trend for the holiday. Thomas was the first guy to come along to fish. He was from Germany and spoke perfect English. He hadn’t been fishing before and wanted to watch. He was really surprised to be handed the rod after I had hooked the fish. He played it well on a light drag. So he was really pleased with his first ever fish. Thomas fished for a few days with me before he would go home. Next to came along on the evening was a lovely bloke called Eddie. He was from Tilbury and fished the Thames for cod and bass. By the morning Eddie had sorted out more bait that kept us going for a few more days. We fished together until I left. Unfortunately he did get speared by a prawn in his finger and it went septic which put him out of action for a couple of days while he was taking the antibiotics. Linda made sure he kept off the beer. Linda and Eddie made for perfect partners and were good fun. But most days we would fish while Linda sun bathed. Eddie caught about the largest fish of the holiday a beaker fish of about 3lbs or so. We played boules each afternoon at 3pm and I had been telling Eric and Zuhair about my fishing and catching lots of fish. 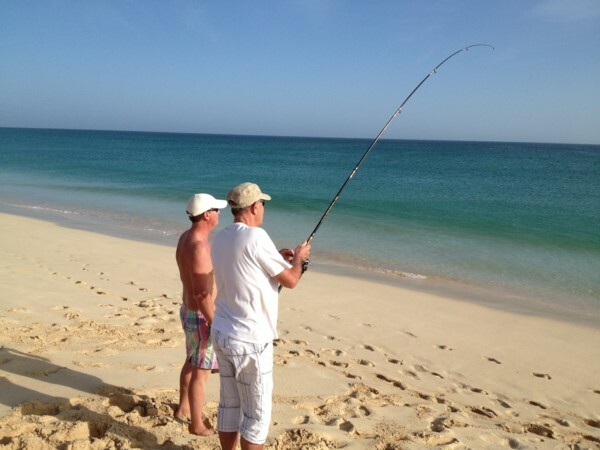 So there I was fishing away when Eric turned up and stayed for 10 minutes or so. I didn’t have a bite so would of had my leg pulled later in the bar. 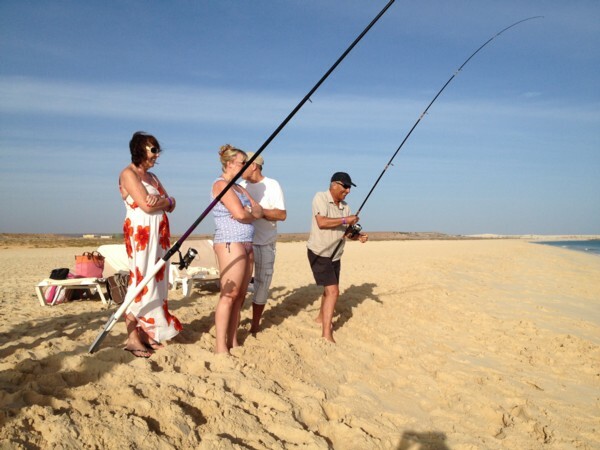 However just as Eric was leaving the rod bent over and a good fish pulled back on the other end. 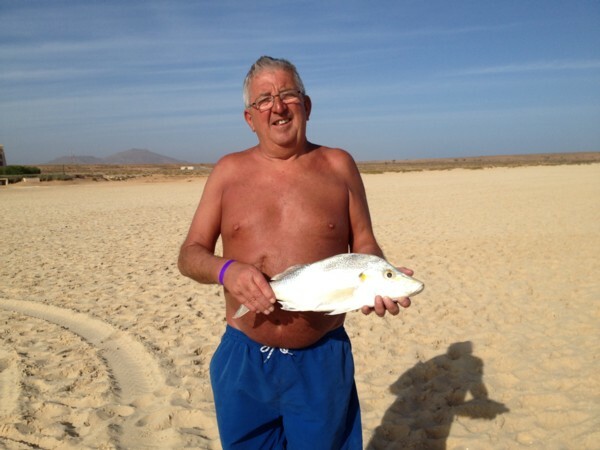 Now Eric had fished before so knew what it was about and played the fish well. By this time I had developed a ploy to hand people the rod once a fish had been hooked. Once it was landed and photographed then I would say that’s 100$ please!!! You should have seen the faces!!!!! So there was some great fun. Now all this was reported back in the bar during the evening of course. Zuhair and his wife Claire were very interested. Zuhair told the story of him fishing in Iraq with a bent pin and catching many fish. 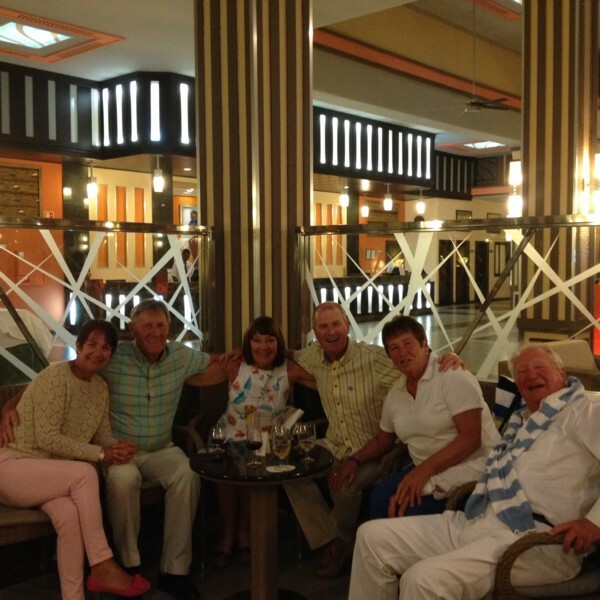 I also met a lovely couple Nico and Conny from Holland. 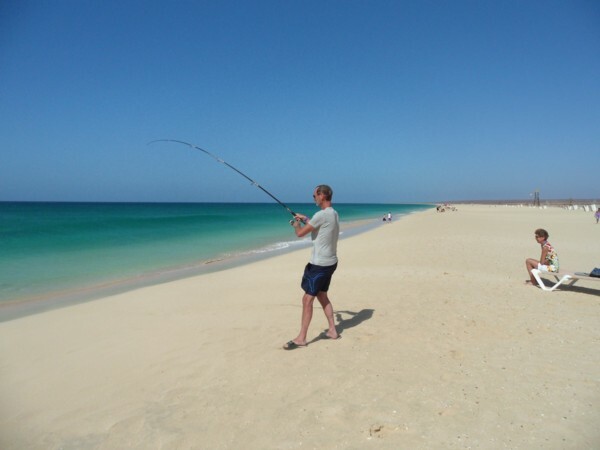 Nico fished for cod in Holland and was used to beach casting. I think he thought my tackle a little light compared to what he normally uses, 150g gripper leads and strong line. They both used to come down for 40 minutes during the morning session. 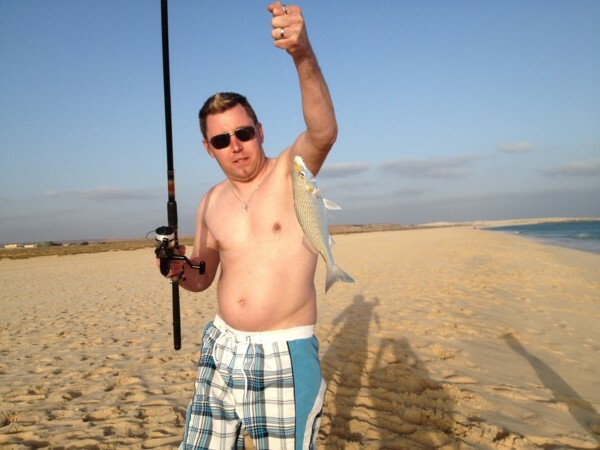 Nico fell for the same prank of giving him the rod when a fish was hooked and me charging 100$ when the photo was taken. He also hooked a good few fish for himself using my gear. It seemed like everyone wanted to chat and see Eddie and I landing fish. Zuhair and Claire came along to see what we were talking about each evening in the bar. 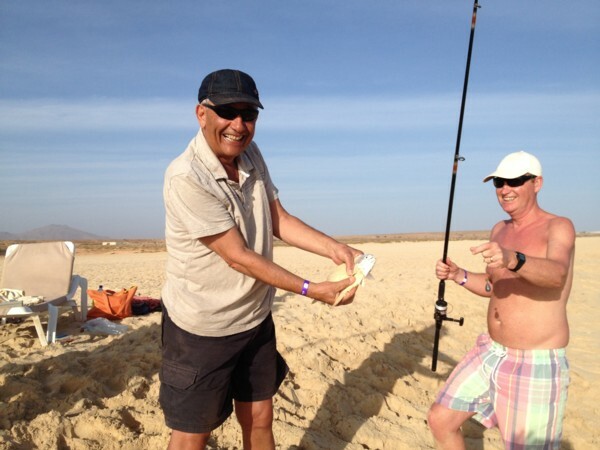 I hooked a fish and gave the rod to Zuhair and he played a good size fish. So once it was landed the 100$ trick was used again. It seemed like all the larger fish were being landed by the people I was giving the rod to. All I seemed to catch was small bream type fish. So that was it another very satisfied customer. Next it was Claire’s time to land a fish. It wasn’t very large but another 100$ for me. Only joking of course. The waves had been very good to us during the two weeks however towards the end of two weeks there the wind did pickup and caused some huge waves to crash onto the beach. You could even hear them booming onto the beaches from our hotel room with the door closed. Having said this I could just about hold out for 5 minutes or so before they would crash and wipe me out. You just knew it would be difficult but each time I caught. None of the bigger fish coming my way. So each morning a German couple Claus and Iddie would stop and talk. 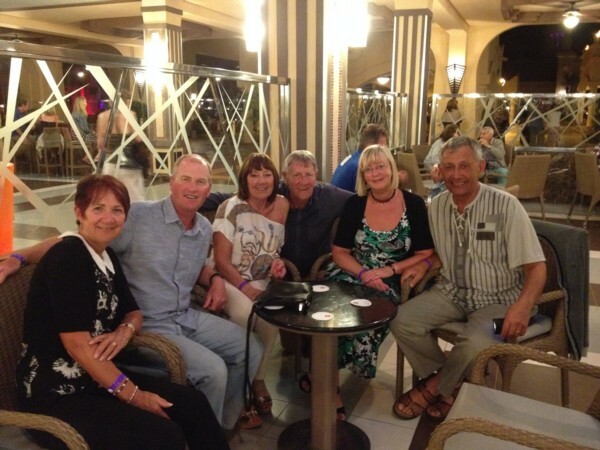 They were a wonderful couple who we played boules with each day. They were great company and Claus would always show us his jiggy, jig impression when ever asked. 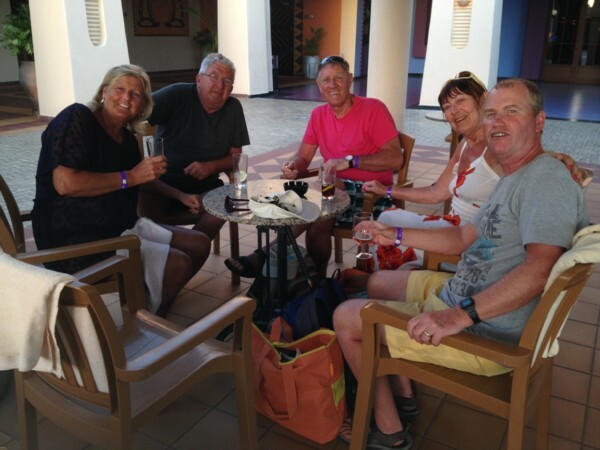 Each evening at 6pm we would all meet in the central bar to watch the sun go down (sundowner) with a beverage of sorts. Poor Eddie couldn’t enjoy this as antibiotic and alcohol don’t mix. Again these moments are to treasure with such nice people. It’s a small world (until you come to paint it). I was in the bar one evening when this chap along to me and said are you Kenny Parsons and I instantly recognised him as Rob a chap I guided back a few years ago. I even remembered the size of barbel he caught. He was there with some friends from my village back home, it really is a small world. So he said that he would come along and see me fish. I did the same old trick with handing him the rod. So the penultimate day was here and still I hadn’t caught anything large. The wind was particularly difficult this day and the waves really got up. I still caught a few but it was difficult. Soon the last day was here. 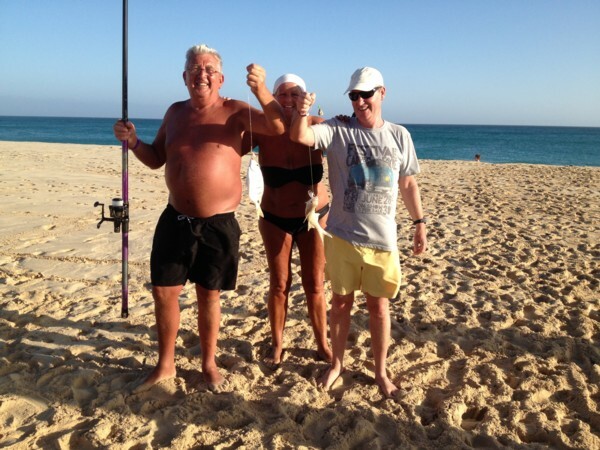 Nico and Conny came along to see if I could catch a bigger fish. The waves were at their peak and crashing on the beach. However my 50g weight was just heavy enough to hold for the waves that were not so high. 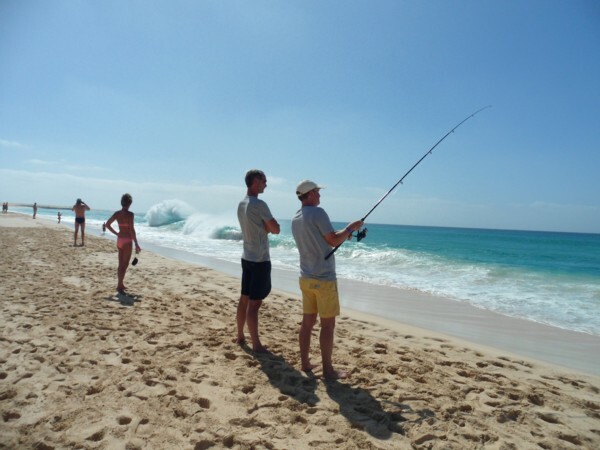 There were plenty of people on the beach watching the waves and plenty around us fishing. At one stage there must have been 20 people around us watching the fish being landed. I’m embarrassed to say I got a round of applause when I landed one fish. Nico said he should have been around selling tickets to watch. So the morning session ended with me landing one slightly larger fish but not the monster. So there I was 4pm casting out for the final session, plenty of bites were coming but hitting them was difficult. Then at about 5.30pm the rod arched over and a good fish was on the other end. I played it gingerly and finally bought it in on a big wave. At last not the largest but a very satisfactory result. A beaker fish that was bigger than anything I had caught before. 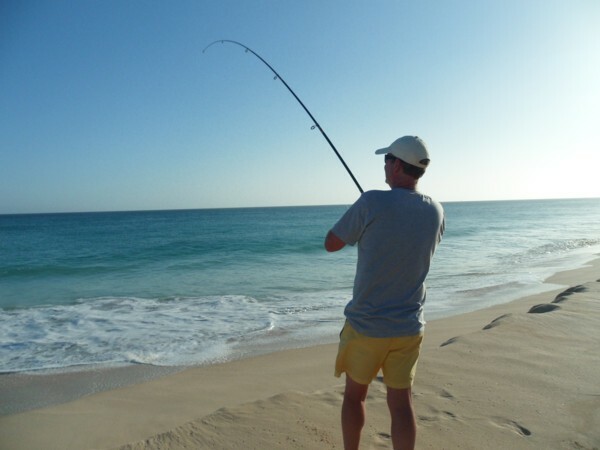 Time for one more cast before we headed up for the sundowner. Eddie and I had a double hookup and we landed a couple of bream to finish the session and a remarkable couple of weeks. Eddie Linda and me. The last of the day. This entry was posted on Saturday, March 29th, 2014 at 2:46 pm	and is filed under Uncategorized. You can follow any responses to this entry through the RSS 2.0 feed. Both comments and pings are currently closed.